The end of April heralds the first Blues Festival in Thornhill, Dumfries and Galloway. Organised by local enthusiasts from its inception last year, the blues band itinerary is now online and you can get tickets using paypal. If you live in the Thornhill area there are a few outlets selling tickets for the main event in Thornhill Community Centre on the night of Saturday 30th April. 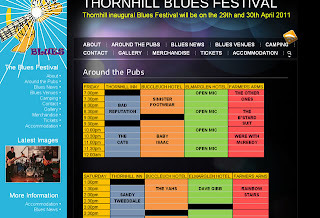 The initial website was a simple wordpress install, slightly customised, to get the Thornhill Blues online. It uses google documents as the source of the embedded spreadsheets. After the festival Callisti would like to improve the website usability and functionality.